Branson has become one of the country’s premiere zipline destinations – with many different ziplining attractions, adventures, and tours to choose from! The beauty of the Ozark Mountains makes Branson the perfect place to experience the thrill, excitement, and adrenaline rush of soaring through the treetops! We’ve rounded up some of the very best Branson ziplines that are worth checking out on your next visit! 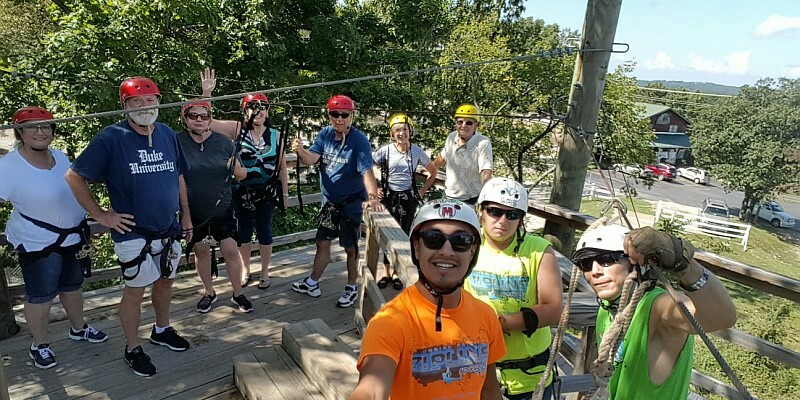 Adventure Ziplines has been rated the #1 Zipline in Branson according to TripAdvisor! Adventure Ziplines of Branson has been rated by Trip Advisor users as the #1 Zipline in Branson! Offering 7 different ziplines that reach speeds of up to 50 mph, it’s a thrilling adventure you won’t want to miss! 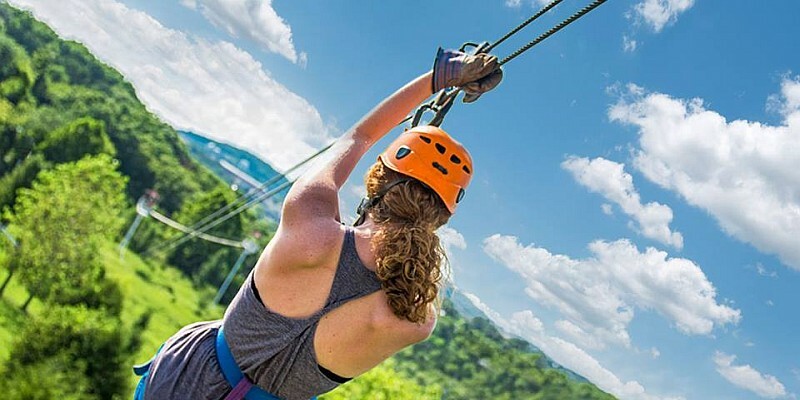 Stretching through the tree tops of the Ozark Mountains and forests, you will cross 3 swinging brideges and zip across 2 miles of cables that climb upward of 70′ tall – offering riders gorgeous, panoramic views of the Ozarks. For extra thrills, flip upside down and zip with your feet in the air if you dare! The tour takes approximately two hours and is led by qualified, accredited guides, so you’ll feel safe and secure the entire time. These ziplines also offer night ziplines and ATV rides. The Branson Zipline at Wolfe Mountain is one of Branson’s most popular zipline attractions and features the all-new SnowFlex snow tube ride on-site as well! Branson’s most popular zipline offers 7 different ziplines, 10 suspension bridges, and an optional 100-foot free fall drop. Fit a visit into your itinerary, as there are multiple ziplining options that vary in time and length to accommodate your schedule. Journey through breathtaking natural beauty beginning at the top of Wolfe Mountain. The tour will take you across swinging bridges and canopies, offering outstanding views of the Ozarks’ countryside. The Nighttime Canopy Tour is a great way to shake things up and get a closer look at the starry sky, while the new SnowFlex snow tube ride offers something like you’ve never experienced! Branson Zipline at Wolfe Mountain has trained and accredited guides that will provide additional fun and safety. 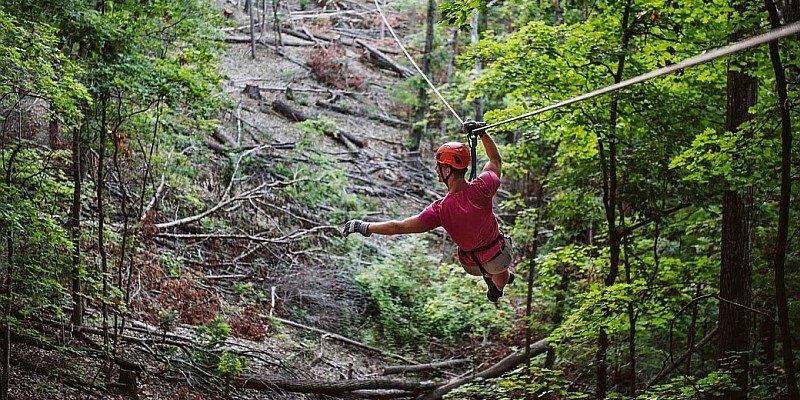 The new Zipline Canopy Tours at Shepherd of the Hills offer one of the most affordable full zipline rides in Branson! 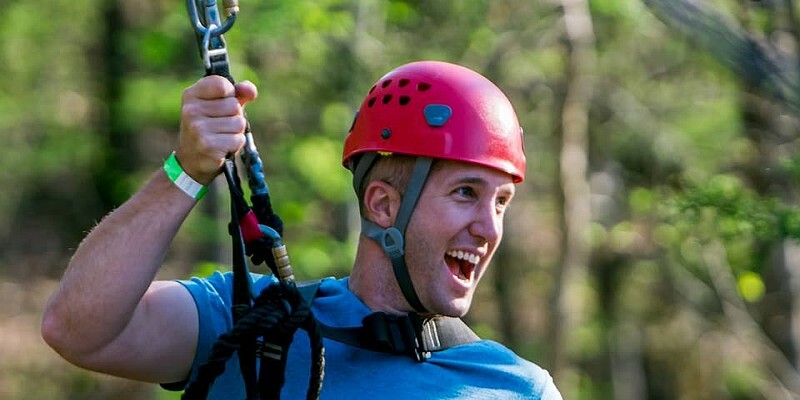 The newest ziplines to open in Branson, the Shepherd of the Hill’s Zipline Canopy Tours offer one of the most affordable (and fun) ziplining attractions in Branson! Located at the historic homestead (home of the famous outdoor drama), these ziplines come with two different courses to choose from. Choose a shorter ride with the 4 zipline option, or go with the longer 8 zipline course for a nearly two-hour experience you won’t ever forget! Explore the new adventure park on-site and enjoy the other fun attractions and activities before or after your ziplining adventure! Launching from the top of the Inspiration Tower, the Vigilante Extreme ZipRider offers the highest zipline in Missouri! 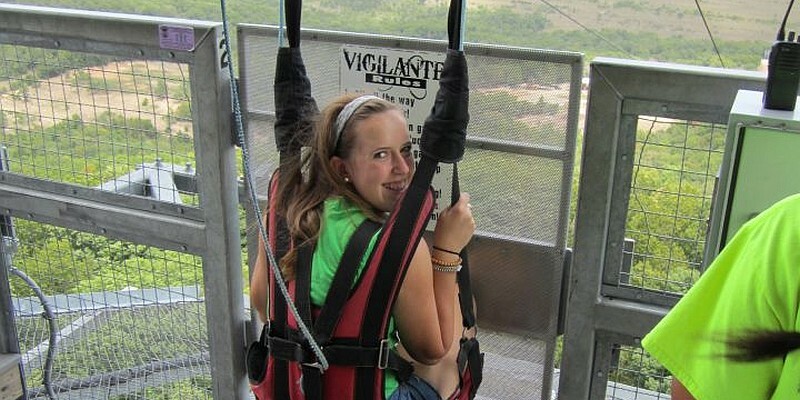 The highest zipline in Missouri makes the Vigilante Extreme Zip-Rider stand out from the crowd, offering a unique zipline ride from the top of the famous Shepherd of the Hills Inspiration Tower! Launch from the observation deck, which towers more than 170′ in the air as you soar over 160-acres of Shepherd of the Hills Homestead and reach speeds of up to 50 mph! This half-mile long ride is also unique as you take a seat for your rides and the brakes are automatic. – just sit down, lean back, and relax before zipping off! You’ll witness a breath-taking view from the highest point in Missouri, giving you a rare look at Branson. Parakeet Pete’s Waterfront Zipline takes riders (day or night) above the waters of Lake Taneycomo and is located at Branson Landing. The most exhilarating and exciting of the many attractions at Branson Landing is Parakeet Pete’s Zipline over Lake Taneycomo! The cool waters of Lake Taneycomo, combined with the swift breeze from zipping across the lake – provides the perfect combination for cooling down while getting your adrenaline pumping! 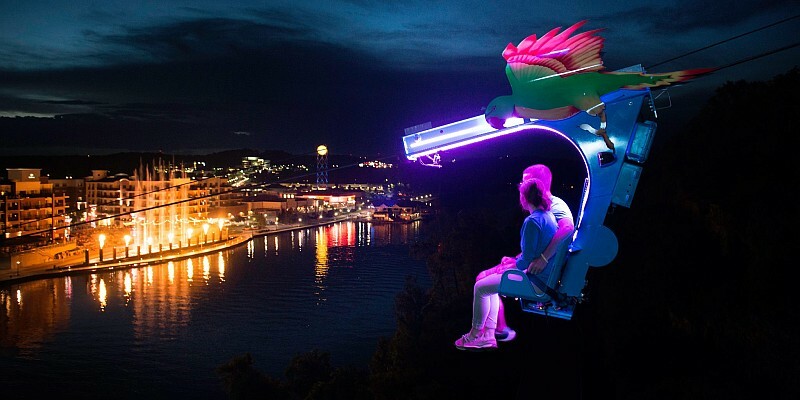 The zipline is a seated ride with an automatic break that takes you from one side of the lake to the other giving you spectacular views of the famous fountains and downtown Branson from all vantage points. Indian Point Ziplines (near Silver Dollar City) is one of the most affordable and fun ziplining experiences in Branson! Indian Point Ziplines is located just minutes from Silver Dollar City theme park, offering fun and excitement for the whole family. There are six ziplines with a sitting harness trolley system that takes riders 2,700 feet through the Ozark Mountain forest. Indian Point Family Fun Park also has a hydro-slide and free fall, so plan ahead if you want to experience the 3 different exhilarating activities! 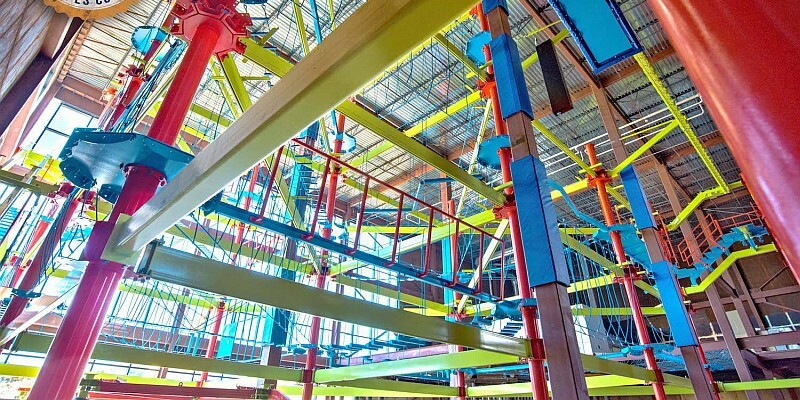 An indoor ropes course is just one of many attractions located inside the Fritz’s Adventure attraction! Although not a zipline in the typical sense, the indoor ropes course at Fritz’s Adventure provides a one-of-a-kind experience you won’t want to miss! Towering several stories in the air, you can walk across the ropes, zip along the specially-designed track, and create memories you won’t ever forget! This isn’t just for adults either, there’s a special, smaller ropes course designed just for the younger ones traveling with you! In addition to the ropes course, the attraction features slides, swings, rock-climbing wall, an indoor adventure, and a brand-new outdoor skydiving attraction – you will want to visit to truly appreciate everything there is to see and do!